1 oz Silvertowne Retro Prospector Silver Bar | ?? 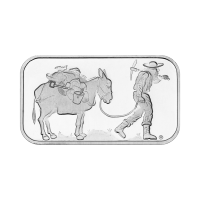 正面 A prospector out searching for his bit of fame with his donkey and tools. 反面 The weight and purity followed by the silvertowne logo and place of issue.